"South Korea's powerful conservative newspapers were the main culprits for misleading politicians and convincing them to push ahead with the impeachment process of President Roh Moo-Hyun despite the wishes of the general populace," a local scholar argues. The observation was made by a group of political scientists and various leaders of civic and social groups during a meeting organized by the nation's largest citizen's coalition for democracy called Bomgukmin. Bomgukmin is made up of nearly 900 civic and social groups. The meeting was held at the Sejong Center for the Performing Arts in central Seoul on March 26, 2004. In the meeting participants agreed that the peaceful mass demonstrations, referred to as the "vigil light protests" are a display of the people's resistance and efforts to save democracy from the "reckless" Parliamentary power shown recently in the handling of President Roh's impeachment bill. 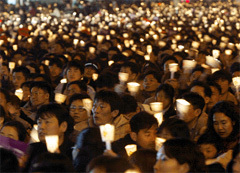 Tens of thousands of citizens have been staging so-called "vigil light" protests in central Seoul every night since the opposition-controlled National Assembly unilaterally passed a bill to impeach President Roh Moo-Hyun amid a strong physical resistance from the minority ruling Uri Party members on March 12, 2004. On March 13 alone 150,000 company workers, college students, housewives, and even toddlers poured out on the streets of Gwanghwamun in central Seoul in their protest against the National Assembly's passage of the impeachment bill a day earlier. The bill was rammed through by the main opposition, the conservative Grand National Party (GNP), and two other minor opposition party lawmakers, who have strongly disapproved of the reform-minded President Roh ever since he was elected back on Dec. 19, 2003. During the meeting, Prof. Cho Hee-Youn of SungKongHoe University's sociology department, said the current political situation was created by a massive number of citizens angry over the passage of the impeachment bill by the conservative anti-Roh lawmakers. "The massive-scale vigil light protests represents the voice of the people who think that the country's hard-earned democracy is under threat by the very deputies of the people (lawmakers) who are entrusted to preserve our freedoms. The lawmakers are remnants of the former, anti-democracy conservatives," said Prof. Cho. "They (the protesters) came out voluntarily on the streets when democracy was at risk." 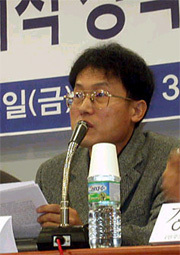 Prof. Cho explained that although the "June" pro-democracy resistance terminated the military dictatorship, it failed to end the forces of conservative politicians associated with past dictators. The impeachment bill was initiated by the remaining conservatives who survived the 'June 1987' people's resistance," he said. In particular, Prof. Cho pointed out that conservative lawmakers seriously erred by carrying out the impeachment process against the will of the general public. "They misread the people's mind because the "Big Three" dailies provided them with a distorted view of the public's true opinion," Prof. Cho argued. The three largest circulation newspapers, the Chosun Ilbo, the Joongang Ilbo, and the Donga Ilbo, have been ferociously critical in their relentless attack against the liberal-minded President Roh and his progressive government ever since his inauguration on Feb. 25, 2003. 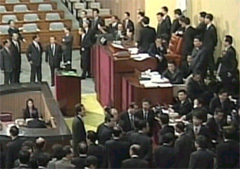 Pro-Roh lawmakers are occupying the National Assembly speaker's podium in their desperate efforts to stop opposition lawmakers from passing Roh's impeachment bill on March 12, 2004. Prof. Cho added that the conservatives lawmakers made a grave error believing that they would gain support from ordinary people by carrying our the impeachment bill because they based their strategy on supposed public opinion twisted by the nation's largest three dailies. As South Korea's three most influential dailies, the so-called "Cho-Joong-Dong" or the conservative "Big Three" dailies have been wielding absolute power on the formation of people's opinion, thus glaring complaints have been heard from liberal forces for their prejudice against President Roh Moo-hyun and his government. "The Big Three" dailies are the ones who never approved of Roh's election as president intrinsically. Instead, they steadfastly clamored for Roh's impeachment ever since his election," Prof. Cho analyzed. "They drove politicians to miscalculate that the people actually wanted to see Roh impeached." Prof Cho also singled out the influence of the internet as an important new medium of communication particularly among young citizens who are far less susceptible to the views and opinions of the major dailies. "The Internet enabled people to rally for democracy in spite of the 'Big Threes' negative coverage of President Roh and his government during the first year of his presidency." Prof Cho said.